The dog leaps into an 8-bit sprite of grass with the duck on his back before they both rise from the grass while the dog performs his signature laugh. Duck Hunt (known as Duck Hunt Duo in the PAL localization, and individually referred to as Dog and Duck) is the name that refers to the playable dog, duck and off-screen hunter in Super Smash Bros. for Nintendo 3DS / Wii U and Super Smash Bros. Ultimate. True to their team name, all three characters hail from the NES video game Duck Hunt. 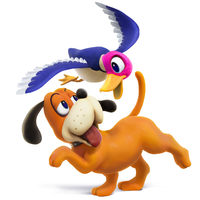 In addition to their appearances in the Super Smash Bros. series, the dog and variants of the duck have made other crossover guest appearances within the Mario franchise in other instances, mainly within the WarioWare series. In WarioWare, Inc.: Mega Microgame$!, a microgame called Duck Hunt appears, and has overall the same gameplay as the original NES game, this time having the player uses the Game Boy Advance controller to shoot ducks. A Duck Hunt microgame similar to the one from WarioWare, Inc.: Mega Microgame$! appears in WarioWare: Twisted!, this time using the Game Boy Advance cartridge's tilt sensor to aim. While the dog does not appear in WarioWare: Touched! at all, the original sprites of the ducks are occasionally released from the ball in the microgame Clawing for More after clearing it. The Duck Hunt microgame returns in the WiiWare game WarioWare: D.I.Y. Showcase, and utilizes the Wii Remote's motion controls. Gameplay of Duck Hunt can be seen on the Nintendo DS' top screen in stage 19 of Standard Marathon mode in Tetris DS, where the dog and duck make a cameo. The dog also appears as a sprite on the touch screen during this stage. 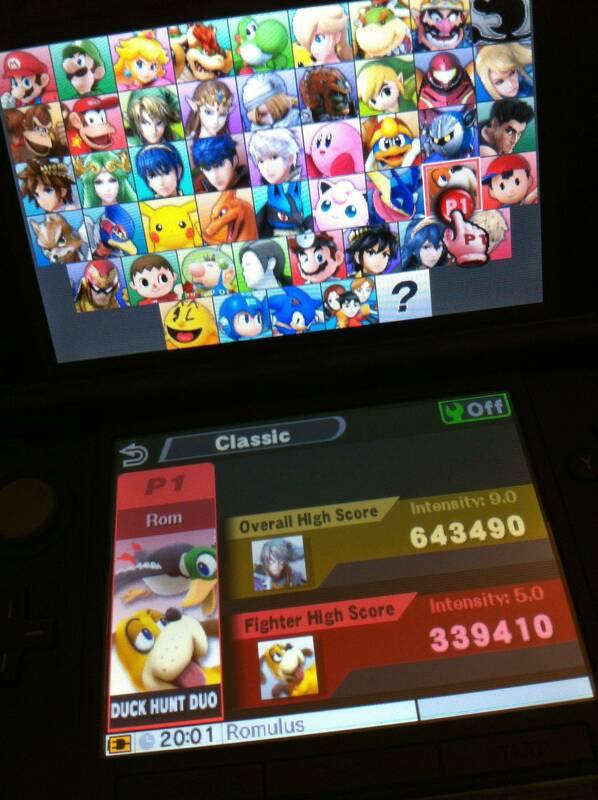 Duck Hunt appear as unlockable playable characters in Super Smash Bros. for Nintendo 3DS and Super Smash Bros. for Wii U. Unlike the other team-oriented fighters in the games, Duck Hunt are a trio, as they consist of the dog, a duck and the off-screen hunter who wields the NES Zapper. 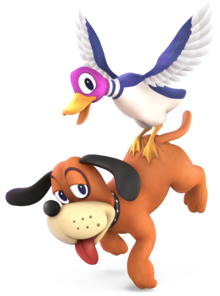 Other quirks that Duck Hunt possess include the dog's ability to wall jump, the duck having its own hurtbox due to remaining alongside the dog at all times, and the off-screen hunter participating in some of their attacks. Their moveset largely consists of moves based around the Zapper and games that use it, particularly Hogan's Alley and Wild Gunman, while incorporating physical attacks from both the dog and bird. 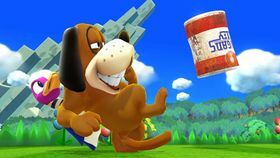 Duck Hunt's standard special move is Trick Shot, in which the dog kicks a metal can from Hogan's Alley before the hunter is able to subsequently fire at the can to propel it. Their side special move is Clay Shooting, in which the dog throws out a clay pigeon from Duck Hunt's Game C that will then explode upon being fired at by the hunter. Their up special is Duck Jump, in which the duck flies upward while carrying the dog. Their down special is Wild Gunman, which spawns one of the five titular gunmen to attack. Lastly, their Final Smash is NES Zapper Posse, which consists of a flock of ducks from Duck Hunt ramming the opponent into a field before the gunmen from Wild Gunmen fire at them and the cutouts from Hogan's Alley. 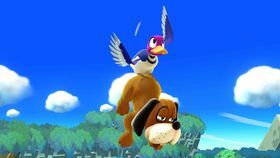 In regard to character customization, Duck Hunt are the only fighters who can use the Collar and Feather equipment to boost their defense and speed, respectively. The duo can also use the Zapper equipment to boost their attack strength, which is another reference their home game. A Duck Hunt-themed stage simply called Duck Hunt also appears in both games. In the stage, the sprite versions of the dog and the ducks appear, even if Duck Hunt themselves are fighting on the stage. In addition, Duck Hunt are the only playable characters in Super Smash Bros. for Nintendo 3DS / Wii U to break the fourth wall in their trailer. Duck Hunt returns as unlockable veteran fighters in Super Smash Bros. Ultimate. Duck Hunt has mainly received improvements to their moveset and can run faster, though they are now lighter. The dog also makes more sounds as it attacks. Trick Shot (named Trick Shooting in the PAL release) is Duck Hunt's standard special move. The move involves the dog kicking out a can from Hogan's Alley, which bounces forward for every time the special move button is pressed. The player can press the button eight times before the can automatically explodes the next time. It also explodes when it hits an opponent, the explosion able to damage both them and Duck Hunt. The direction the can moves can be changed by attacking it from the other side. Finally, the number of times the special attack button is pressed before it explodes determines how powerful the explosion is. In Super Smash Bros. for Nintendo 3DS and Super Smash Bros. for Wii U, this move has two custom variants: High-Explosive Shot, which makes the can fly out more quickly but it explodes after two button presses; and Zigzag Shot, which sends out a can that moves back and forth after every button press and the explosion sends any players caught upward. Clay Shooting is Duck Hunt's side special move, based upon the clay shooting mode in Duck Hunt. The dog throws a clay pigeon that flies across the screen, exploding when the player presses the special attack button a second time to shoot it, the Zapper firing three shots that also deal damage. The pigeon only explodes once the player presses the button, though it still damages opponents. In Super Smash Bros. for Nintendo 3DS and Super Smash Bros. for Wii U, the first custom variant for this move is Rising Clay, which causes the pigeon to arc downward and then fly up when tossed; however, the pigeon does not explode, meaning that it deals less damage. The second is Clay Break (named Clay Destruction in the PAL release), which tosses the clay farther and at a higher arc but it the pigeon itself does not damage opponents and the shots are more spaced when detonating, though are more powerful. Duck Jump (named Duck Jump Duo in the PAL release) is Duck Hunt's up special move. The duck starts to fly up into the air, carrying the dog with it. Players can control their horizontal movement while the duck flies, but cannot end the move early on their own. In Super Smash Bros. for Nintendo 3DS and Super Smash Bros. for Wii U, the Duck Jump's first custom variant is Duck Jump Snag, which involves the dog also biting to attack nearby fighters, but the duck cannot fly as high. The second is Super Duck Jump, which pushes the duo high into the air, creating a whirlwind that pushes away opponents, but the player cannot move as far horizontally. 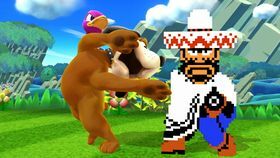 Wild Gunman is Duck Hunt's down special move. The dog pulls out one of the five titular gunmen from Wild Gunman, which each have different properties, such as damage output and speed of firing. Attacking them momentarily stuns them, and if they take 5% damage or more, they do not fire at all. 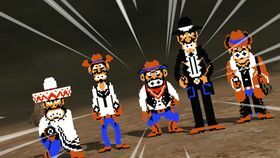 The gunman with the red scarf is the weakest gunman of the gang; the skinny gunman has better range with his shots; the gunman with the black suit can fire shots that send opponents flying at a horizontal trajectory; the gunman with the sombrero fires shots that have a fire effect, but he has the worst range of the five gunmen; the leader of the gang fires the quickest. Each gunman appears at least once during a match, but when all five have appeared, the gunman that spawns when using this move the sixth time and beyond will be chosen randomly for the remainder of a match. Quick Draw Aces (named Quick-Draw Ace in the PAL release) speeds up how quickly the gunmen can fire. Their shots deal slightly more damage, but have less range, and the shots deal less knockback as well. The gunmen also have only 1 HP, and will not fire at all if they're damaged by any kind of attack. Mega Gunman summons a giant gunman who can withstand more damage than normal; the gunman's HP is increased to 40. However, the gunmen take longer to fire, and their shots deal slightly less damage than normal. NES Zapper Posse is Duck Hunt's Final Smash. The dog summons a flock of ducks that fly through the stage, trapping any opponents caught by them. They are then taken to an area where they are caught between the Wild Gunmen shooting at the cutouts and cans from Hogan's Alley. After taking repeated damage from the barrage of bullets, the opponents are then launched and Duck Hunt returns to the stage. If the flock of ducks do not connect with any opponents, the Final Smash fails. Every character in the Final Smash (except the opponents) uses 2D sprites, including the dog and duck who otherwise appear with updated 3D models. Also, no matter what color Duck Hunt are, they always appear in their default appearance during the attack. In Super Mario Maker, Duck Hunt make an appearance as a Mystery Mushroom costume, which plays sound effects from Duck Hunt for certain actions. Upon transforming into Duck Hunt, the perfect score tune plays, and whenever they jump, the dog barks. If they fall into a pit or lava, the dog's laughter can be heard. The costume can be unlocked by scanning the Duck Hunt amiibo, or unlocked randomly after completing the 100 Mario Challenge on the Normal setting or higher. In Pixels, the dog appears as a trophy awarded by the aliens for defeating the Centipede army in London. Two Duck Hunts alongside Kirby, who copied one of them. Duck Hunt using NES Zapper Posse. Usable by: Ice Climbers, Pit, Mr. Game & Watch, R.O.B. NES Duck Hunt (10/1985) You could call these two the stars of the NES 1985 launch title Duck Hunt. The goofy dog would chase down any ducks hit by the Zapper. In Smash Bros., these two work as a team to fight. When a can or a clay pigeon is in play, hit the button again to fire at it. Show your foes how the ducks felt! Back in 1987, when Duck Hunt came out, these two might not have had the best relationship. That all seems to have changed now, and this unlikely pair are here to fight together. After throwing a can or a clay pigeon, press the button again to have a little helper fire the NES Zapper for extra damage! NES Duck Hunt (10/1985) Duck Jump, an up special, has the charming twosome float up in an adorable fashion. It also makes getting back to the stage much easier. Their side smash can hit up to three times at close range, depending on your shooting skills. By charging up the attack, you can increase the range even further! Duck Jump Duo, an up special, has the charming twosome float up in an adorable fashion. It also makes getting back to the stage much easier. Their side smash can hit up to three times at close range, depending on your shooting skills and by charging up the attack, you can increase the range even further! N/A N/A In this Final Smash, three games from the Light Gun Series team up: Duck Hunt, Hogan's Alley, and Wild Gunman. A flock of ducks fly by, warping anyone they hit to the Wild West. There, a posse of gunmen will use foes for target practice! If the ducks don't hit anyone, though, nothing happens besides some birds passing through. N/A NES Duck Hunt (10/1985) In the NES game Duck Hunt, the dog is your trusty hunting partner. He scares the ducks and then picks up the ones you hit. If you don't hit any, though, he'll laugh at you. So much for man's best friend... In the Duck Hunt stage in this game, he'll occasionally pop up in his 8-bit glory and let you use him as a platform! N/A NES Duck Hunt (10/1985) In the classic NES game Duck Hunt, you hunt, er...ducks. The dog flushes them into the air, and then you aim and fire. Taking down ducks get you points in the Duck Hunt stage in this game too. 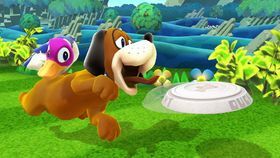 It has no effect on the battle, but the alternative Duck Hunt action might be a refreshing change from constantly punching your friends in the face. Pit: I don't want to fight that cute dog! Palutena: Oh, you won't. You'll be fighting the dog AND the duck. Pit: is duck on the menu for dinner?! Palutena: Let's take things one step at a time, Pit. These two may seem like a duo, but they're actually a trio! Together, they're known as "Duck Hunt." Pit: So where's the third team member? Palutena: Listen, just be careful. You could get shot out of nowhere. Pit: A mysterious sharpshooter, eh? Well, that does make things more exciting! These two were the stars of the NES launch title Duck Hunt, way back in 1985. This goofy dog would chase down any ducks hit by the Zapper accessory, but wasn’t shy about laughing at missed shots. In Super Smash Bros. for Wii U and Nintendo 3DS, these two work as a team to fight. Quack! Bark? Both! The Duck Hunt microgame in WarioWare: Touched! bears the Duck Hunt title, but instead of featuring the dog and ducks, it uses clay pigeons from Duck Hunt's Game C.
This page was last edited on January 27, 2019, at 19:27.